Are you ready for the adventure of a lifetime? Join us on one of our daily flights to Oshkosh in 2014. Reserve your seat now, as space is limited! Summer is almost here, which means warmer weather and long days of flight are quickly approaching! 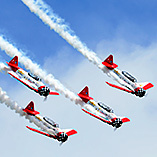 Check out what's on the calendar at the Warsaw Flying Club and don't forget to schedule your flights before we fill up! The Warsaw Flying Club’s Young Guns program is a great program specifically designed for young kids and teens, ages 17 and under, interested in getting their career in aviation started early. A lot has changed for the Warsaw Flying Club and we are so excited about the new additions, positions, and people that are learning to fly with us! This month’s student spotlight features Warsaw Flying Club Private Pilot, Amber Hodorek.